When it comes to today's busy urban living environments, more and more of us are being forced to make the most of tight situations. Living in the big city, sufficient space tends to come at a premium, and employing creative solutions remain our saving grace to a sense of spaciousness in the home. Within a limited floor plan comes a limited range of divided rooms: apartments these days tend to be two or three rooms at best, with some even preferring an open plan type setup in order to induce a sense of greater spaciousness. As good as an open plan setup is, there will be times where we need a sense of division and separation between some spaces, without making our homes look cloistered and cramped. Here's where those creative solutions are needed. One of the key separation points in a domestic setting concerns the dividing line between the kitchen and living areas. 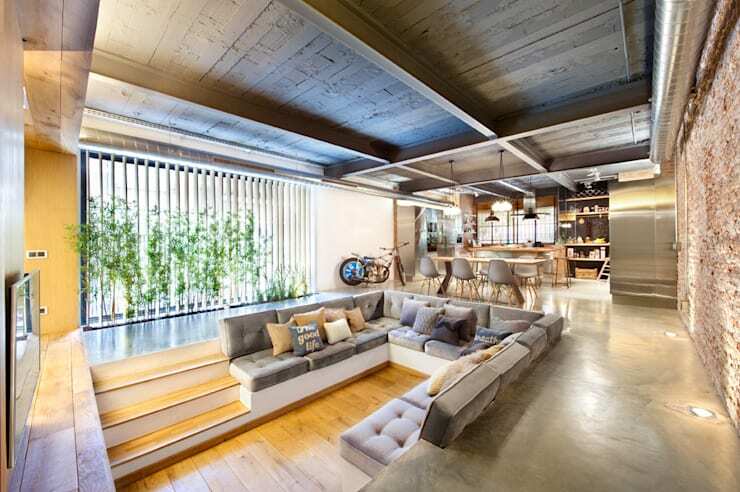 Open plan spaces tend to merge these two disparate, yet harmonious areas, and that can be a good or bad thing depending on your preferred aesthetic and sense of functionality. If division is what you're after, the good news is that there are a range of different design tricks and methods for creating a sense of separation between these two spaces. Today on homify, we're taking a stroll through some fabulous examples of kitchen and living area separation. Walls aren't the be and all and end all when it comes to a sturdy and effective dividing point: take a look at the examples below and get inspired about how to make the most of your spaces. Of all the many options available for separating the kitchen and living quarters, a good solid dining table is amongst the most aesthetically pleasing and effective. The right choice of table can bring a whole new dimension to the livability of a space, providing the perfect demarcation point between the functionality of the kitchen area, and the relaxed environment of the living quarters. As we see in this positively delightful example, a generous wooden dining table cuts a fine image: robust, attractive, and functional in more ways than one. This is a table that truly multi-tasks: a vital functional addition to this immaculately appointed modern home that provides a clear sense of separation between this kitchen and uniquely sunken couch living area. Choosing the right furniture for the home interior, whether it's a dining table or otherwise, can be a challenging task if you're not quite sure where to begin. If this is the case, why not chat to a professional about the range of options on offer, and what might work the best for your unique spaces? The low wall provides another fine creative solution for any confined kitchen and living area that is in need of a sense of separation. If walls are your thing, and you'd prefer to work with them instead of a piece of dividing furniture, this is the perfect way to go: a wall that goes only halfway, inducing a distinct point of division, without blocking off the space and providing unnecessary obstruction. 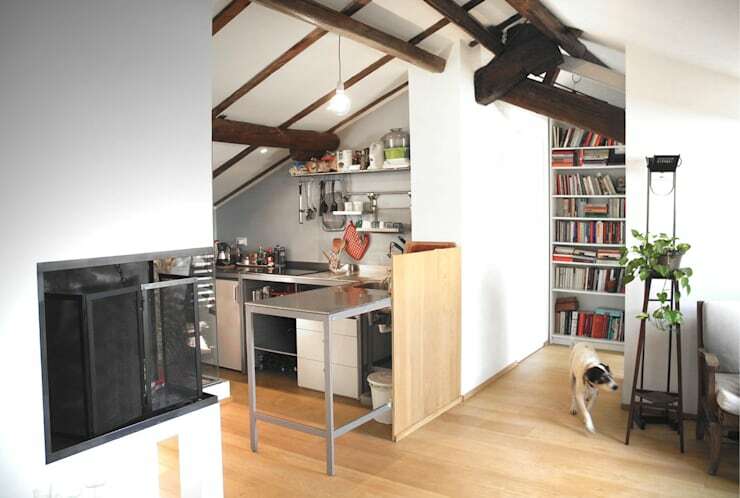 Here, we see the virtues of the low wall in action: a cosy kitchen space with modern trimmings, neatly sectioned off without being totally cut off from the adjacent living area (even the family dog likes what he sees). As an alternative to a dining table, the floating island is another excellent choice for creating a pronounced sense of separation between kitchen and living area, without going overboard with the division. We love a good multi-tasking piece of furniture or hardware here at homify, and the floating island is certainly one of the best: a relatively simple design that provides a wealth of storage possibilities and space for accessories, while making a clear division between spaces at little risk to the breathability and flow of an open plan space. Here, we see a fabulous floating island at work: large, versatile, with a stunningly dark stone finish that really anchors the energy of this space and provides the perfect blend of functionality and aesthetic edge. When it comes to even smaller domestic spaces, such as one room studios and modest open plan apartments, the range of furnishing options may be a little slimmer, and you'll need to think even more creatively in order to induce a desired sense of room separation. 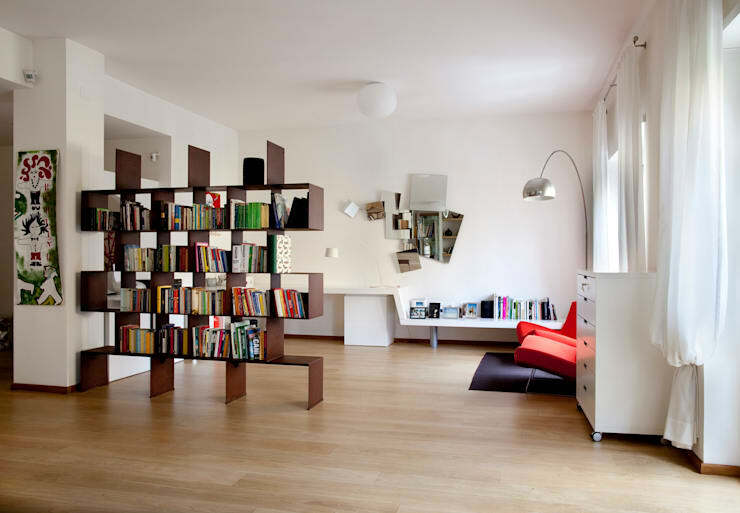 Here's a fabulous example of what can be done in this instance: an artfully designed, and thoughtfully installed bookshelf that provides a perfect, unobtrusive dividing line between kitchen and living quarters that can't help but enhance the aesthetic appeal of this already well-appointed domestic interior. Consider your space, and select a bookcase that really works to complement your unique areas. Of course, all this talk of separation without using walls is all well and good, but what if the more traditional wall option just so happens to be your ultimate preference? What if a wall, and only a wall is what your domestic space demands for a fine sense of kitchen and living room separation? The solution here is clear: work with walls for the desired effect. Here, in this delightfully renovated and remodelled modern interior, a pre-existing brick dividing wall has been retained and worked with, in order to section off the two spaces more than adequately, and maximise the rustic originality of the dwelling. If a wall does the job, there's no reason why it shouldn't be harnessed as a crucial dividing point, especially when the spaciousness and breeziness of the interior isn't overly compromised. Again, if our spaces demand and lend themselves more than adequately to a certain style or aesthetic choice, then there's no reason why we need to look any further for a more alternative or creative solution to our space division needs. If your kitchen and living area is functioning just fine as a truly open plan set up, then it ought to be embraced and celebrated. Here, we see how the division between living room and kitchen can be a subtle, almost non-existent one and still retain a sense of aesthetic and functional design success. Sure, a basic dining table functions well here, but as far as a divider is concerned, it's fairly light on: this is a space that flows well with an unencumbered sense of space, and that's just fine as is. Again, it all comes down to understanding the way your space is constructed, considering the architecture and dimensions of your areas before beginning any project, and assessing the needs of your spaces accordingly. Did you enjoy that Ideabook? 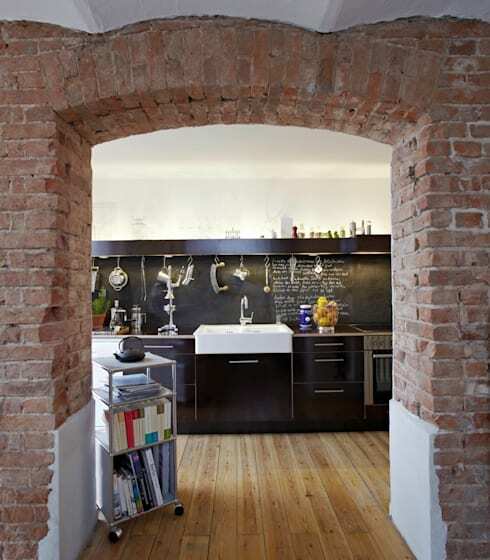 Why not keep the excellent ideas flowing with a look at How to separate spaces without building walls? Do you have any other handy space dividing tips for our readers? We’d love to hear from you in the comments section below!